Mitta's participation on "Amata Day" (28 June 2009)at MBT, saw a large number of volunteers who were on hand to give Reiki treatment to the public.It may have been a very short "experience" but obviously many were overwhelmed and "touched" by the warm hands. The many questions asked and information requested were evident that the public were keen to know more about Reiki. To all the Mitta volunteers and supporters who had sacrificed a beautiful Sunday but to be there, "THANK YOU" and may you and your family be blessed by the Triple Gem. The workshop on" ENDING SUFFERING" by Bhante Kumara on Saturday, 27 June 2009 was interesting and beneficial. Bhante's vast knowledge on many aspects of life and how to overcome suffering, his beliefs and experiences commanded the silent attention and appreciation from all of us.His ideas and opinions regarding the cause of afflictions and how "to educate rather than to medicate which only reduces symptoms but not to extend life" had been thought provoking. Besides this, many of us will remember his advice on how we should not respond to provocation which we can control. Triple "SADDHU" to Bhante, & the organising team for selflessly and jointly contributing to the successful holding of a wonderful and enlightening talk. The well thought of anticipation, preparations and participation of each and everyone have contributed to the smooth running of Family Day 2009. The success of the event which saw a large group of friends, volunteers and well-wishers enjoying the many arrays of "yum yummy..." food and the excitement of getting "Lucky Draw" gifts was evident by the smiles shown on their faces. 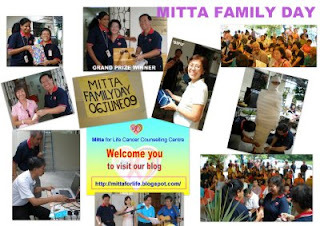 Despite the afternoon heat, many enjoyed themselves in the singing, dancing and the successful launching of Mittaforlife blogspot which rounded off a memorable day. Never mind the little "flaws" and tired limbs, the important thing is we had a great time and Mitta family members are eagerly looking forward to another such get-together. ................With Metta.